Bob Redman grew up on the Upper West Side of Manhattan and was discovered by the Parks Department after he built a series of intricate tree houses in Central Park in the 1980s. He was hired by the Central Park Conservancy as a climber and pruner. "He sometimes amazes his colleagues by racing up tree trunks and walking in the trees," wrote William Geist in a New York Times column about Redman. 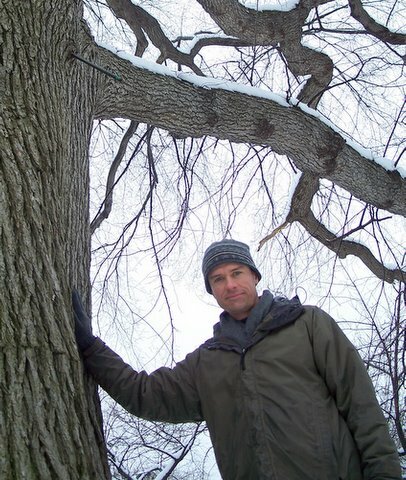 As an independent arborist, Redman has maintained the trees for Tudor City Greens by the United Nations, Washington Market Park in lower Manhattan, the Turtle Bay Association on the East Side, community gardens and block associations, and hundreds of residential and commercial clients. He is an ISA certified and New York City Department of Parks and Recreation/Forestry-approved arborist who has worked as a consulting arborist for the Second Avenue Subway, George Washington Bridge, Harlem Hospital, Jefferson Market Library, and numerous other construction projects. "I take a personal interest in caring for New York's trees because I've lived here for 40 years and it's my backyard," Bob says. "I enjoy helping trees survive in this challenging environment, especially because New Yorkers need trees for their emotional as well as physical health." Bob Redman admiring a specimen American Elm in Central Park.